1. We have the privilege of helping a family in Houston renovate their ruined first floor in their home from Hurricane Harvey. Aymee and I wanted to help, and when the opportunity came up, we jumped on it! Aymee's lifelong friend from college was interviewed on the news, and when Aymee talked to her, she had the idea of helping them somehow with their design choices. It's such a stressful situation, and they are grieving over the disaster in their city. We immediately reached out to her friend, Karli, and asked if we could help ease the stress by offering our design services for free. We are trying to reach out to vendors to see if they will donate items, and would love your support in their remodel if it's something you can/want to give towards (www.gofundme.com/sistersflooded). The family doesn't have flood insurance, so they're having to take a huge loan out to fix their home. We are excited to help them through this difficult time! 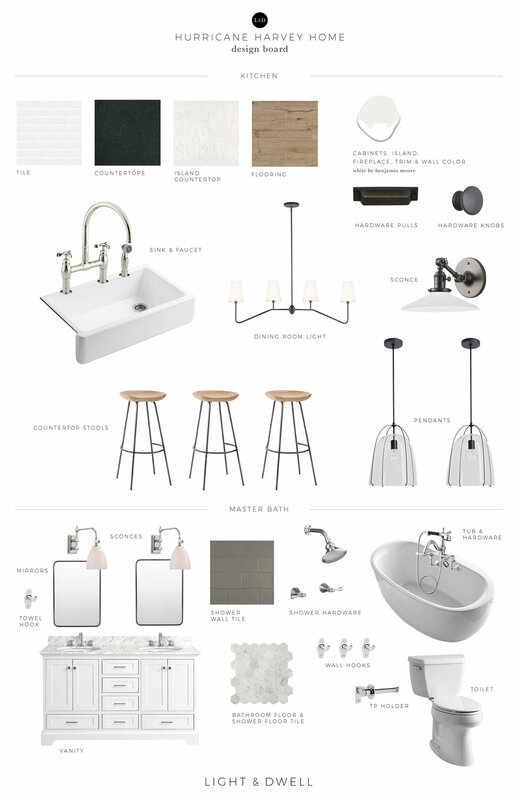 Here's the design board for their hard finishes! We are keeping it classy and timeless, since the home has some existing brick and molding that didn't get ruined in the flood. 2. Everyone in Aymee's house is getting a new school bag. She's in the mood. What does she keep getting drawn to, no judgers please…diaper bags! She's afraid that if she gets one, people will ask her if she's with child haha... Which, to clarify, she's not! So, instead, she's looking at these leather bags (1, 2, 3)… What's your vote? 3. Being a mom changes the game when it comes to finding the perfect jeans. I'm no longer wearing "low-rider jeans", everything must go to the belly button thank you very much! Here are a few of my favorite "mom jeans" that are in style (1, 2, 3, 4, 5). 4. Faux Florals aren't necessarily my favorite thing to use in spaces, but they are really practical. Lately, faux florals have been upping their game! Here are a few I've recently ordered for clients that I've been pleasantly happy with (1, 2, 3, 4, 5, 6). 5. It's no secret green is our favorite color around here. Lately, I've been really drawn to olive green. I can't seem to get enough of it! 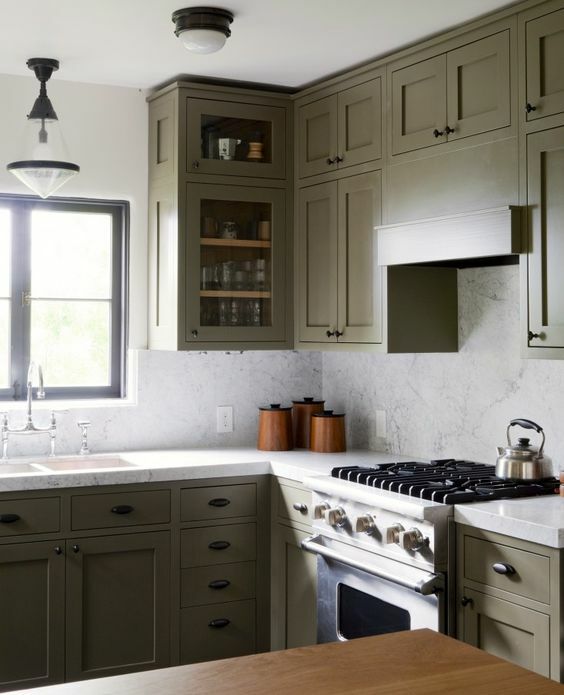 Here are a few spaces that are really inspiring me with this beautiful olive color.